I haven't blogged in over a month. But the truth is, most of us don't have the time to do all of that. And if we try to do it all (while maintaining healthy relationships with friends and family, managing school/work, raising children, running errands, cooking food, exercising....basically living a life) we might not put our 100% best into what we're sharing with the world. Now don't get me wrong, I give major props to all you full-time bloggers! I'm so inspired by you guys and happy that you've found something you love and are doing it! (and making some extra moo-lah, too $$$) ? But honestly, I haven't even thought much about blogging this past month. I was just so engrossed with school, spending time with family, and working on our Kickstarter project. It wasn't until people at school started telling me how much they love my blog that I realized, "Oh no, am I a bad blogger? I haven't blogged in so long. People are counting on me, and I'm letting them down." Attempt to live life first; make online updates an echo of that when there's time. What if we spent just half the time we do on the internet and social media on something else? What new adventures would we have? What relationships would improve? I'm not saying to swear off of internet and social media completely, but I do believe in being intentional about how we interact with it—directing and using it for good, rather than letting it direct our time. 2. Blogging less doesn't make me a bad blogger. I am going to blog less, but it will be consistent because I do love blogging! I'm aiming for 2-4 posts a week to keep burnout at bay. 3. Blog post ideas are everywhere. You don't have to sit at your desk to make a list of blog post ideas. The best ones seem to hit you when you're taking a walk, talking with a friend, listening to a lecture, or just observing people in the street. Those ideas tend to be the most unique as well. I don't regret not blogging for a month. I feel like I've come out of my break refreshed with a new outlook, and that makes me excited! Frequent blogging doesn't make you a good blogger. Being your authentic self, sharing ideas, encouraging others to grow and learn—that's my definition of good blogging. What about you? I want to hear your thoughts! How often do you blog? Do you feel like it's the right frequency for you? The other day I realized that it has already been over six months since I started this little blog of mine. And in those six months, I don't think I ever told the story behind my blog or explained what the name The Kardia even means! 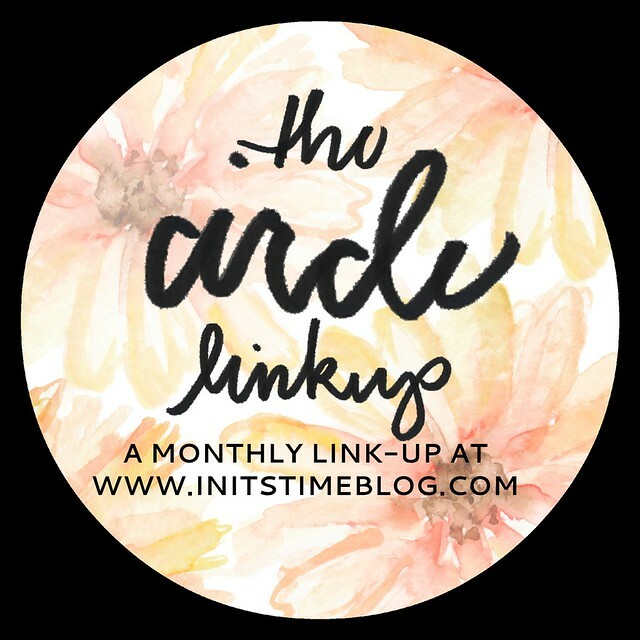 So when I stumbled upon Kiki's blog In It's Time yesterday, I discovered that the prompt for her monthly linkup this month is "the story of your blog name". I've been meaning to join in on The Circle linkups for a few months now, so what better time to begin than today! I don't remember the exact time when I began reading blogs, but it was somewhere around the beginning of fall 2012. Back then, I read mainly home decor and craft sites like Centsational Girl (weird for a 17-year-old who lived in a dorm right?) and A Beautiful Mess. Around the fall of 2013 I stumbled upon blogs like Life Could Be a Dream and A Beautiful Exchange. I never commented though because I felt like needed a blog of my own. As Christmas time came around, all I would talk about were blogs. Caleb told me that I should start one, but I would always brush him off. "Nah, I don't have enough to say" or "I don't have time, maybe when I'm older and have a house." But my love for blogging just grew and grew until I finally gave in (I mean, who was I kidding? Was I really going to wait until I was in my mid-20s? I was only 18!). I bought the domain name in February 2014 but it took me all summer to get my blog design the way I wanted it and muster enough courage to post my first post in August. Coming up with a blog name was really difficult for me. I knew right from the beginning that whatever name I choose was the name I was going to stick with for good. I wanted to build a brand, not just start a blog. After writing down every possible combination of lovely words I could think of, I began the process of elimination. The funny thing is, the name I ultimately choose wasn't even on that original list! The name was picked after I decided what the purpose of my blog was. When Caleb asked me, "What are you going to blog about? ", I had to really think of how to answer. Yes I wanted to blog about "life", but I also wanted to share date ideas and turn it into a database of some sort. I wanted to make printables and document our dates to give others inspiration to do their own. Knowing this, I decided that the name of the blog should have something to do with love. Somehow I ended up typing the words "heart in different languages" into Google, and that's when I found it. Kardia means heart in Greek. The Kardia. The heart. It was perfect. While my blog has a different direction now than when I first started it, the meaning is still the same. The Kardia is a blog of encouragement and inspiration, written from the heart, with Christ at the center of it all. It gives energy to those seeking a life of purpose. It's a place where unconditional love is valued, simple moments in life are celebrated, and where I whole-heartedly believe in the promises of living a meaningful life. The Kardia will grow and change just like I'll grow and change, but it'll always be my "heart". What's your story? Comment below or join the link-up! P.S. Learn how to write your own blog mission statement! (You really need one). I absolutely love all things creative. I'm like a sponge, I soak up everything and anything I see. So when Gina Alyse tagged me on this virtual blog tour, I got so excited! This writing process tour aims to connect bloggers and lets you take an inside peek at their creative process. I'm thrilled to share mine with you today! These past few weeks have been crazy busy. Honestly, finding time to blog is really hard. I treat it like a job, which is a good thing, but I need to find a balance in my life so I don't get burnt out. One of the things I've been working on lately is taking pictures for my photography class. This class is pushing me to take my camera with me more and to just take pictures. I really want to capture life and little moments that may go unnoticed. Another thing I've been working on is actually a secret :) Don't worry though, I'll announce what it is in the next few weeks! Hint: it involves travel and food. My writing process is being constantly refined. It usually begins by finding inspiration, whether it be through other blogs, scrolling through Pinterest, listening to professors, taking a walk, talking to my friends, or listening to music, etc. I once tried to keep a journal with me to write down all my ideas, but I found that I would forget to bring it with my everywhere. Now I use a Google Doc to list out blog post ideas and a secret Pinterest board to other inspiration. I found that this works best for me because I can update it from my phone or computer wherever I happen to be at the moment. Even though I'm still relatively new to the blogging scene, these girls both reached out to me and said hi. I'm so glad to have the chance to foster a new friendship with both of them. Check out their blogs and keep an eye out for their upcoming posts! McKenna from That Good Life Vibe: McKenna and I are long lost twins. After discovering her blog and her likes and dislikes, I realized that we have so much in common! I love having friend who can relate with me, even if it's through long-distance. She has such a sweet blog and I always look forward to her Sunday Posts. Taylor from Life in the Lost and Found Bin: Taylor and I had the chance to connect by swapping ads on each other's sidebar. I'm so glad I discovered her blog! She always has posts full of tips and advice. Her post about how yoga changed her life got me motivated to begin yoga and stretching as well! I can't wait to read their posts! What's your creative process like? How do you foster creativity?